Ignition Switch and cable 1928-31. This is the basic non popout style switch but gives you the authentic cable appearance under the bonnet. This is our high quality A-11575-EM switch with the pop-out appearing cable that runs down to the distributor. An end is installed on the cable for easy attaching to switch. This is a complete replacement switch & cable to keep the authentic look on your model A and mounts to the instrument panel as per the original. Note: Switch does not pop out like the original, when you turn the key on. This is a very good quality off-on style switch that has been modified to mount and look like the original pop out style switch. When installed, it looks just like the old pop out switch, but does not pop out. (Will not work with the original one piece ignition cable and switch). Genuine Nu-Rex brand, made in USA. Reproduction pop out style switch With Accessory Terminal 1928-31. Exactly the same switch as our A-11575-EM except this one has an extra terminal on the back for accessories. Genuine Nu-Rex brand, made in USA. Accessory Ignition Switch for the 1928-31 Model A Ford. (non popout style) Has two screw terminals on the rear. (Will not work with the original one piece ignition cable and switch). Comes complete with 2 keys. Ignition cable to fit the replacement non popout style switches with the terminals on the rear of the switch. (Will not work with original style popout ignition switch). This replacement cable only fits the original pop out switch heads that had a solid back on them. They were made by Electrolock, Phila., PA. Note: This 1930 cable is slightly longer than the 1928-29. Comes with clamp and grommet. Made in USA. Emergency Ignition Jumper Cable. Screw one end of this wire into the distributor, remove red wire from the coil that goes to the ignition switch and clip jumper cable to the coil terminal where the red wire was attached. 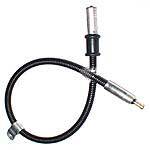 When using this jumper cable, the ignition key will no longer stop the engine. Your will need to unhook the jumper wire from the coil. 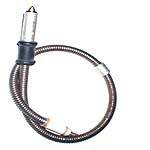 Pop out cable only for the 1930-1931 Model A. 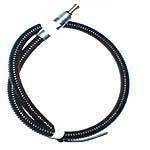 The replacement cable only to repair your original, on cars with the round speedo. Fits original pop out heads that had a removable back plate on the switch. Made in USA. Ignition switch On Off Plate 1928-31. Brighten up the dash with a nice new on-off plate. 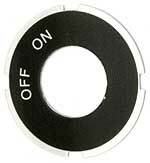 One side has the on-off emblem, or turn over for plain black. Made in USA. Ignition Switch Plate Ring 1928-31. 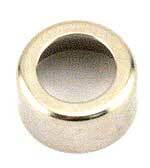 The chrome ring that holds the on-off plate into the instrument panel. Made in USA. Ignition Switch Data Plates 1928-30 Round Briggs. For the original pop out switch cable. Make it look like it did when it left the factory. Made in USA. Ignition Switch Data Plates 1930 Oblong Briggs. For the original pop out switch cable. Make it look like it did when it left the factory. Made in USA. Ignition Switch Pop Out Head Cap 1928-31. This is the cap that covers the back of the otiginal pop out switch heads. Made in USA. 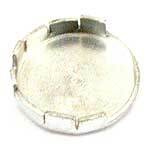 Ignition Switch Pop Out Key Hole Cap 1928-29. For the original pop out switches, this is the cap where the key goes into the switch assembly. Made in USA. 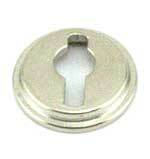 Ignition Switch Pop Out Key Hole Cap 1930-31. For the original pop out switches, this is the cap where the key goes into the switch assembly. Made in USA. Ignition Switch Pop Out Key Hole Bezel 1928-29. 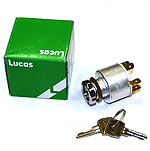 The cap used on the original pop out switch to hold the key hole cap in place. Made in USA. Ignition Switch Pop Out Key Hole Bezel 1930-31. The cap used on the original pop out switch to hold the key hole cap in place. Made in USA. Ignition Switch Pop Out Mounting Set 1928-31. This set has the 3 screws to mount the switch head, one grommet for the cable where it goes through the terminal box, one wire nut. Made in USA. Pop Out Cable Clamp 1928-29. This cast design was used from April of 1928 until May of 1929 to hold the pop out cable to the head. Made in USA. 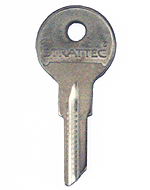 A universal style key that will work on all years. Note: These blanks only fit the original pop out switch, they do not fit the Reproduction switch that we offer. 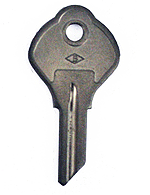 Exact copy of the original Briggs & Stratton ignition key that the 1928-30 used with oval speedometers. 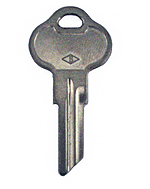 Exact copy of the original Briggs & Stratton ignition key that the 1930-31's used with round speedometers.